Swing dancing is nothing more than a hop, spin, and jump from your reach. Or at least that’s how it looked on Friday night as dancers effortlessly grooved to the jazzy tunes in C-Shop. With Einstein Bros. Bagels closed down for the night and the tables piled in the back, the space was transformed into a dance floor. Couples danced together, and the vibe was intimate yet communal. Loud chatter and pounding feet added to the fast-paced, high-energy music. 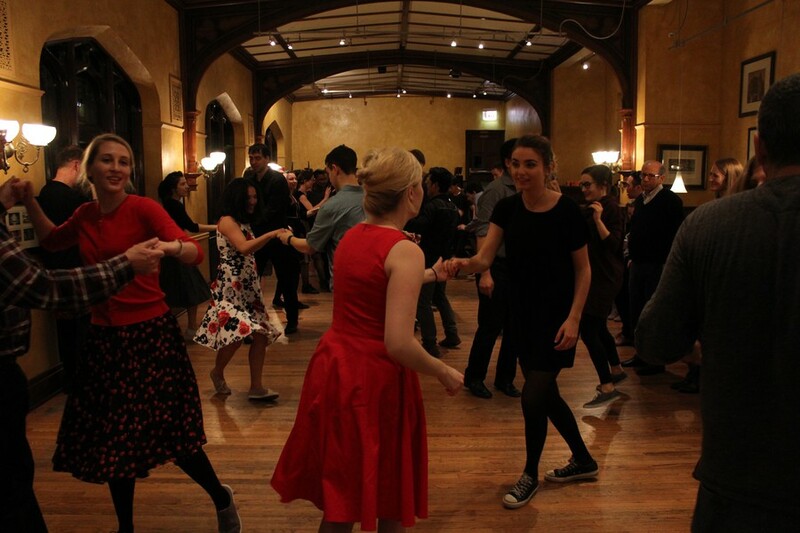 The Chicago Swing Dance Society (CSDS) usually holds their weekly Java Jives in the third-floor theater or Library Lounge of Ida Noyes. 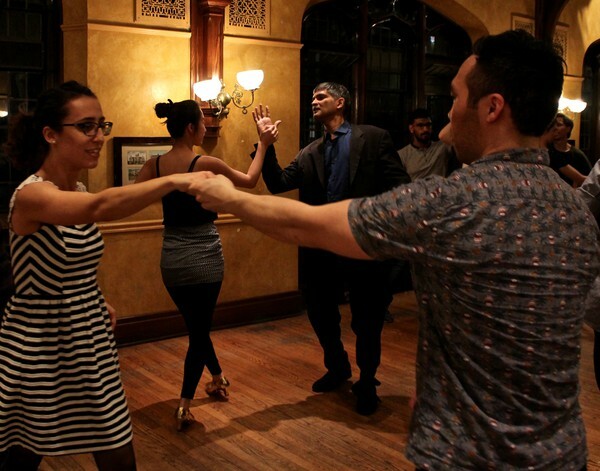 Last Friday, CSDS celebrated 20 years of swing dancing where it started: the coffee shop that put the “Java” in “Java Jive.” The event, which was well-attended, marks a resurgence in the popularity of swing dancing at the University. There were only two members on the CSDS board when fourth-year Theresa-Anne Tatom-Naecker, co-president of the club, first came to campus in 2012. Since then, CSDS has grown immensely: It now has 14 board members. Yee taught the first swing dance classes in International House, where he lived, with his friend Nicolle Wood, whom he had met at a separate swing dancing event in Chicago. “[My time at UChicago] definitely served me well in terms of my continued teaching methods,” Wood said, who now owns a dance company in Chicago and regularly attends swing events in the city. YouTube did not exist and the Internet was harder to navigate back then, so Wood and Yee would show videos and direct their students to archives of swing history. “It was something that wasn’t really known at the time—people didn’t know what they were getting involved with, so we really made a point to approach it very holistically,” Wood said. Wood, who first became involved in swing dancing while she was a student in Detroit, recalled coming to Chicago right before the swing dancing boom of the ’90s. As swing grew, other students looked to make the group more official. In 1997, Young-Jin Kim (A.B. ’97) founded the Chicago Swing Dance Society and, working with Yee and Wood, helped build the community at the University. This revitalization of swing coincided with the larger swing revival of the ’90s, an era during which bands like Big Bad Voodoo Daddy invented neo-swing: a novel form of swing music that mixes contemporary rock sounds with classic swing music. Reeves, who often DJs for Java Jives, tries to provide a range of styles, adding big and small bands, old and new music alike. The only requirement is that it must have an eight-count rhythm, which allows for a great deal of flexibility in selection. Another student DJ attempted to bring Maroon 5 into the mix; friendly quarrels on the limits of swing-worthiness ensued. Swing dates back to the booming jazz scene in the Roaring Twenties. People wanted to pair the uninhibited feel of the music with free, improvised, and playful dance steps. One of the original and now most popular forms of swing was the Lindy Hop, which emerged from dance styles born out of the Harlem Renaissance. The Charleston, a style incorporating foot taps and kicks, was an instant hit. The Breakaway was another, in which partners broke away and improvised their own steps. Swing dancing grew from these original steps, incorporating countless others to become the dance people know today. While swing has a rich narrative, there is controversy surrounding its origins. The adoption of the dance, which has African-American roots, by predominantly white communities raises the question of cultural appropriation. CSDS believes it is nevertheless important to understand and honor this history, but does not believe that the point of the dancing should be to bring back the past. “I think swing dancing should be creating a new thing. It’s not the same as it was…even the kind of dancing people do to the music evolved a lot,” Reeves said. This idea of evolution fits with the constant development of swing dancing throughout the decades. After the formation of Lindy Hop, which consists of eight-count steps, there was the emergence of the Jitterbug, a six-count variant. These dances flourished through the country in the ’30s, with countless competitions and films capturing the swing community. Then artists like Dizzy Gillespie switched to “bebop” jazz in the ’40s, and big bands shrank to maintain economic viability. Eventually, a simpler form of the dance called East Coast Swing emerged, because instructors found that the Lindy Hop was too difficult to teach. East Coast Swing is the style that the CSDS teaches to their beginner students at the University today. As swing is a partner dance, the connection between two dancers is essential. “You communicate using tension in your arms—this elastic push and pull type of feeling—as well as visual cues. It’s mostly slight signals communicated through touch and pull,” Reeves said. Yet swing dancing is at its heart a social dance, and CSDS emphasizes that there is no need to attend as a couple: People switch partners throughout the night. Reeves said Java Jives strives to make all attendees feel welcome. 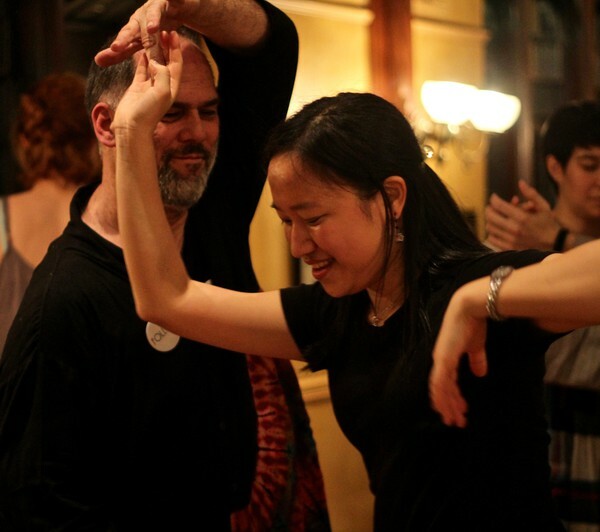 She has observed that it is much more intimidating to dance with strangers at other dancing events in Chicago, where a certain hierarchy in the outside community makes it hard for newcomers to pair with more experienced dancers. But with CSDS, dancers of all levels partner up, providing a safe and supportive place to improve. This environment invites a unique blend of young and old attendees from all around Chicago. Students from schools like Northwestern, the Moody Bible Institute, and the School of the Art Institute of Chicago (SAIC) are regular attendees, along with adults who live in the broader Chicago area. Through their open and free dances, CSDS creates a diverse community of dancers who would not otherwise meet. Two dancers do the “swingout,” the signature move of Lindy Hop. Both Tatom-Naecker and Reeves point to a certain obsession with the past as a reason for the resurgence in the dance’s popularity. “I think people like vintage stuff, like throwing it back and dressing up on a Saturday night,” Reeves suggests. Though it might seem a bit cliché to have a “throwback” event, CSDS nonetheless adds new and exciting energy to the swing world. The crowd was visibly joyful for the entire event, smiling during and between dances. No person in the space seemed scared to approach a stranger, or unwilling to go for that crazy move that they had never tried before. Everyone was friendly and sought to create a community not just around the dancing, but around the excitement that each person brought to the floor. These dances will continue to run weekly, with another special event this Saturday, when a live band will join the group for a night that is sure to be filled with life.